Nitrogen is a crucial nutrient for plant growth. Just like in animals, nitrogen is needed to create proteins and replicate DNA. 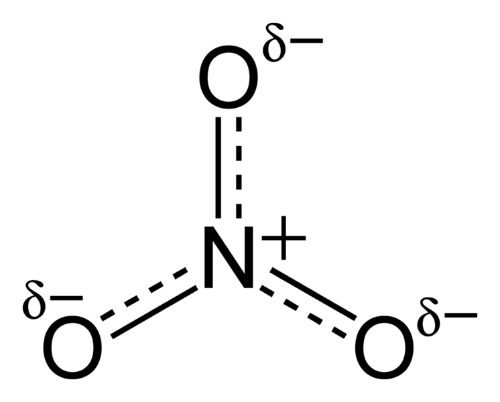 Nitrate is the essential source of nitrogen for plants. It is absorbed from the soil by the plant’s roots. Once inside cells, nitrate is reduced to a related chemical called nitrite. The nitrite is then quickly reduced to ammonium, which in turn is converted to amino acids (the building blocks of proteins) and other useful molecules needed for plant growth. The whole process, nitrate to nitrite to ammonium to amino acids, only works when the plant is growing and can use the nitrate available in the soil. Sometimes though, nitrate can accumulate in the plant. This happens in two situations: first, if soils are over fertilized so that there is just too much available nitrogen and second, if plants are so slow-growing that they can’t use nitrate fast enough. The second situation can happen in winter grown salad greens. Picture a greenhouse in the late fall and early winter – day length is decreasing so plants aren’t growing very fast, but the soil isn’t very cold so roots are still drawing up nitrate that won’t be used right away. Plants, especially salad greens like spinach, store the excess nitrate in cell vacuoles for use later on. This can be a problem because high enough levels of nitrate can be harmful to consumers. Nitrate itself isn’t harmful, but when it is digested in your gut it can be converted to nitrite and nitrosamines, which may be carcinogenic (cancer causing). You may have heard something similar in relation to sodium nitrate in preserved meats or nitrate in drinking water. Because of this, the EU has specified maximum allowable levels of nitrate for leafy green vegetables. Winter grown spinach should contain 3,000 milligrams of nitrate per kilogram of crop. Winter lettuce grown under cover can contain a bit more - 4,500 mg NO3/kg. The acceptable daily intake of nitrates is 3.65 mg/kg of body weight (or 1.66 mg/lb). So, let's say you're a 150 pound guy and you eat 50 grams of spinach in your salad. At the maximum allows amount of nitrate in spinach, could that be more nitrate than the acceptable daily amount? So, you're ok for the day. Ever practical, I wanted to know what farmers do to avoid this problem. A first practice used by growers to keep their crops from accumulating too much nitrate entails knowing the source of nitrogen in the soil and how fast it is made available for plant uptake. Nitrogen from compost or slow release fertilizers is gradually released over time. If it’s cold out, nutrient release slows down, and is more in sync with the needs of slow-growing crops. However, in liquid-based fertilizers, nutrients are available for plant uptake right away, and fertilizer rates that are appropriate for fast growing summer crops might be too much for slow-growing winter crops. In my research I used a mature, compost-based soil substrate so I didn’t have to worry about too much nitrate accumulation in the salad greens. If I were growing salad greens in a hydroponic system without soil excess nitrate accumulation in the crops would have been more concerning. A second practice farmers employ is waiting until later in the day to harvest crops. Lab studies show the accumulation of nitrate in spinach shoots grown under low light levels has a diurnal rhythm. Nitrate amounts are higher at night when the plant isn’t actively using it and lower during the day when the plants are photosynthesizing and growing. Field studies don’t show as much fluctuation between daytime and nighttime nitrate levels, but waiting until later in the day to harvest salad greens seems reasonable. You might also need to let your crop defrost. Martijn B Katan Nitrate in foods: harmful or healthy? Aiko Kaminishi and Nobuhiro Kita. 2006. Seasonal change of nitrate and oxalate concentration in relation to the growth rate of spinach cultivars. HortSicence 41: 1589-1595.